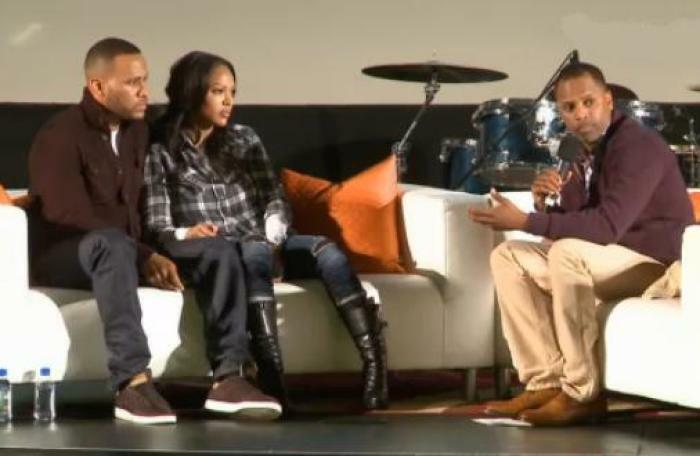 Devon Franklin and Meagan Good are giving people a crash course on tapping into God's plan for relationships and marriage. The celebrity couple has joined Empower U, an Essence magazine e-course that educates people on a multitude of topics that includes love, finances and health ahead of their upcoming book, The Wait: A Powerful Practice for Finding the Love of Your Life and the Life You Love. Franklin and Good will serve as instructors for the free online course called "The Wait 101: Discover the Love of Your Life," which will teach lessons from their upcoming book. According to a description for the lesson, the couple will help people "master delayed gratification for a life you love. If you want to tap into God's masterful plan for your life and relationship, this course is for you. Get ready to learn the life-changing message that waiting — rather than rushing — can be the key for finding the person you're meant to be with." While a complete guide can be found in the couple's book, some topics they will tackle in the e-book will include the reason for considering the wait, strengthening willpower, controlling urges, dating, and prayer. Franklin, who's a Hollywood executive and pastor, and his wife, who's an actress on the TV series "Minority Report," previously revealed the reason they wrote a book about abstinence. "We're writing a book, it's called The Wait," she told late night TV host Jimmy Kimmel during an interview about the book last year. "I'd been in a couple relationships and I was like, 'You know, this isn't really working for me.' I wanted to do something different." "Spiritually, I believe it's what I should have done, and so, I was like, 'You know, I'm going to try it this way,'" Good recalled. In 2012, Good married Franklin. Although the Christian couple has been vocal about finding joy in one another, Good previously shed light on some fears she had before exchanging vows. "What I feared about marriage was that I would lose my identity and be controlled or suffocated or like a caged lion. And what I found was the exact opposite," Good told Upscale magazine in 2013. "I'm way more empowered, more content, more confident and just freer across the board." "Oddly, you would think in marriage it would make you feel like you have less freedom, but I'm finding that I have more freedom [since I've been married] because I trust myself more and I'm a little bit more absolute about my choices," she added.